Jeff and Diane are the third generation of Hills to run a store at 121 4th Street, Baraboo, WI. There has been a Hill in downtown Baraboo for over 60 years! The first Hills, Jeff's grandfather and his sons, opened their business in the 1950s selling small appliance and electronics. After his return from military service in 1972, Jeff joined the family business. Over the next decade, under Jeff's influence, the focus of the business gradually evolved to include gifts and custom floral arrangement. In the late 1970s, Jeff expanded further into custom framing. The custom framing business began almost by accident. Looking back, Jeff explains "K-mart had come to town and we knew if we wanted to continue in business we would need to diversify further." Well K-mart has come and gone now, but the Hill's remain and custom framing remains one of the mainstay products of Hill's Gallery & Gifts. Now with 30 years of custom framing experience under his belt, if you collect it, Jeff can frame it. Come wander the aisles of Hills Gallery & Gifts. The Hill's downtown store is now an inviting Gallery featuring Jeff's beautiful millefiori polymer clay jewellery, Diane's photography, and the work of many regional artists. Hills Gallery & Gifts also carries Bean Pod Soy Candles and Lang products. Gorgeous custom silk floral arrangements - using your vase or one sold at Hill's, can be ordered. 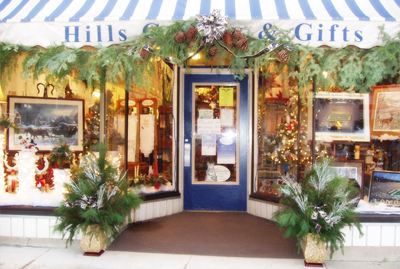 Come to Hill's Gallery & Gifts to find the perfect gift. * The Home of Spring Hill Photography.